Deploy the micro service on Cloud Foundry in SAP Cloud Platform.Use SAP Cloud Platform API Management to secure, publish,analyse and monetize APIs and micro services to internal and external consumers. Click here to find the code used. Insights and Monitoring – tracking meaningful data and statistics in order to give an accurate view of production. Dynamic Routing – dynamically routing requests to different back-end clusters as needed. 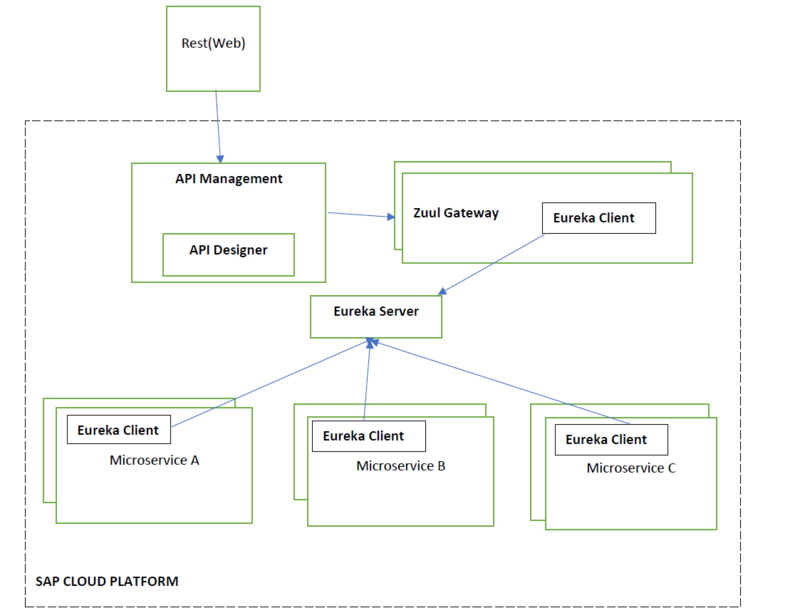 Eureka is a REST (Representational State Transfer) based service that is primarily used in locating services for the purpose of load balancing and fail-over of middle-tier servers. Latency and Fault Tolerance -Stop cascading failures. Fallback and graceful degradation. Fail fast and rapid recovery. Real Time Operation-Real time monitoring and configuration changes. Watch service and property changes take effect immediately as they spread across a fleet. Concurrency -Parallel execution. Concurrency aware request caching. Automated batching through request collapsing. Once the app is running the Swagger Spec would show all the available APIs hosted by the micro service. Now that the service is available, let the stakeholders and customers use the service ,but first make sure the service is protected ,metered and throttled.